Eligibility for PET post (UGD-P.Ed/ B.P.Ed/M.P.Ed. with a minimum of 50%, in case of SC/ST, 45% of marks in the relevant course are eligible to apply. Date of Demo/interview - Will be intimated to the finalized Candidates by email/SMS). Residential pattern duties assigned to them by the Principal/ Head Office. Men Part time PD/PET shall be posted to Boys Institutions only. Merely applying for the post shall not entitle the candidates for any claim to the Part time PD / PET position without following the selection procedure. 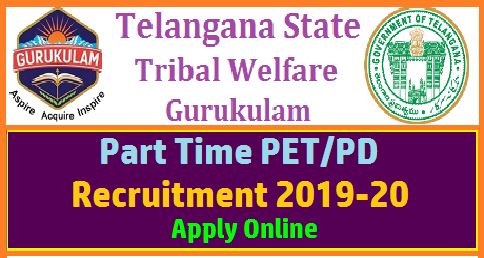 Interested Candidates have to apply online through www.tgtwgurukulam.telangana.gov.in.